This recipe has quickly become one of my favorite winter meals to make. 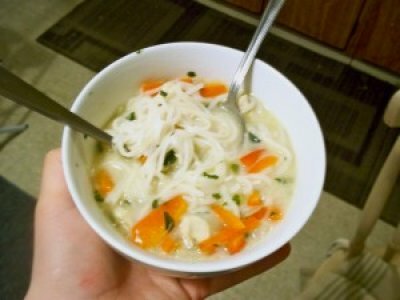 I love cooking soup in the winter, because it’s so easy and usually pretty cheap. In a large soup pot, mix together the chicken stock, green enchilada sauce, and green chilies, bring to a boil. Reduce to a simmer and add all of the spices, chicken, and rice. Let simmer for about 10 minutes, then add frozen corn and cream cheese. Bring to a low boil and cook until cream cheese has completely melted, stirring occasionally to combine. This entry was posted in Chicken, Mexican, Soup on January 26, 2014 by Miranda @ Tempest Books. Heat a large pot over medium heat and saute the garlic in the olive oil for 2-3 minutes. Add spinach and turn heat to low; cook until spinach wilts. Add chicken broth and season with soy sauce, 2 tablespoons cheese, and black pepper. Mix together the water and cornstarch to form a slurry; stir into the chicken broth. Bring soup to a boil. While waiting for soup to boil mix together the eggs, egg whites, and remaining cheese. Once boiling turn off heat and add slowly add the egg mixture. After 30 seconds you may stir. Allow soup to sit for 5-10 minutes and serve. 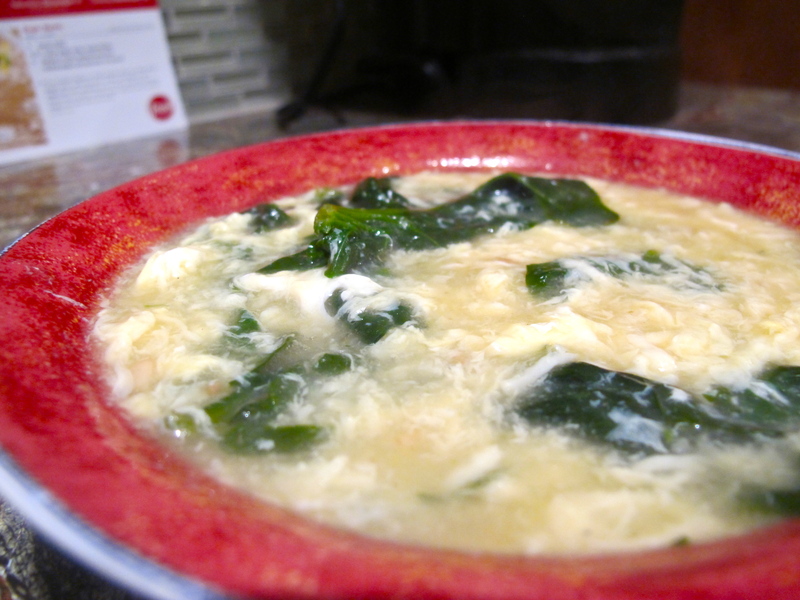 This entry was posted in Asian, Soup, Vegetarian on January 17, 2014 by Miranda @ Tempest Books. Heat olive oil in a large soup pot over medium heat. Add onion and stir occasionally until soft and translucent (about five minutes). 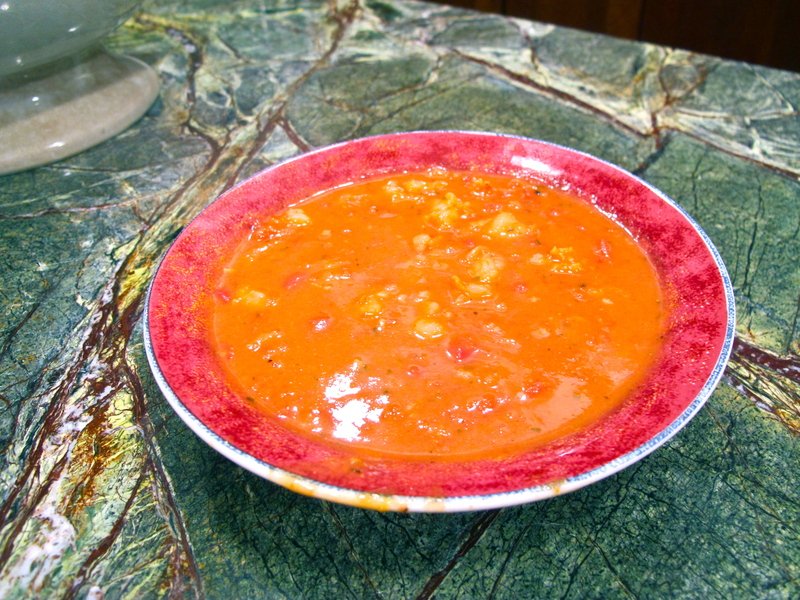 Purée the plain diced tomatoes in a blender or food processor until smooth. Add puréed tomatoes and fire-roasted diced tomatoes to pan along with vegetable broth. Bring mixture to a boil. Add finely diced broccoli and reduce heat to simmer. While soup is simmering, cook pasta. When pasta is done, drain water in a colander above the soup pot to add liquid to the soup. 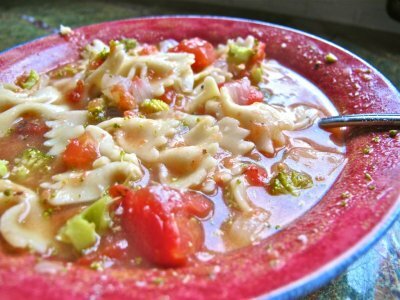 When pasta is drained, add pasta to the soup and stir to combine. Serve soup with parmesan cheese topping sprinkled on top. 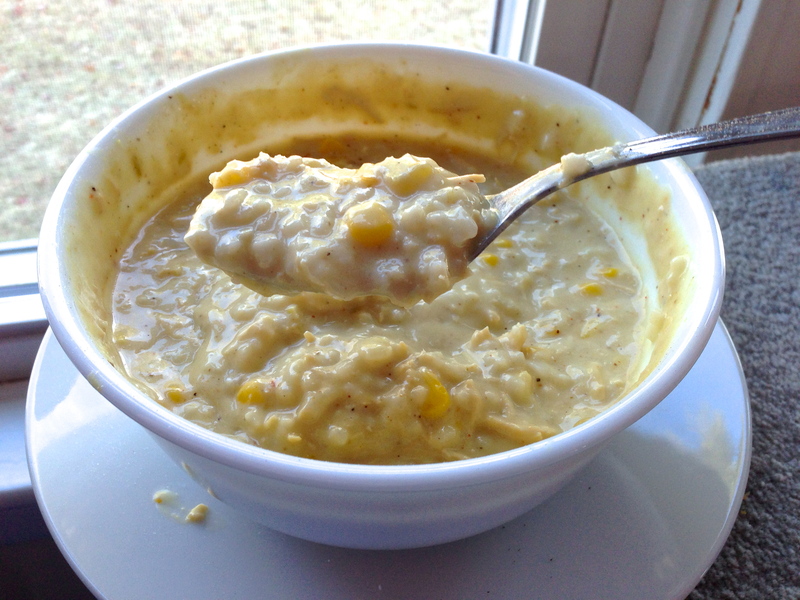 This entry was posted in Soup, Vegetarian on January 17, 2014 by Miranda @ Tempest Books. Heat 1 tablespoon oil in a 4 or 5 qt. stock pot or dutch oven over medium. Season shrimp with the first five spices in the ingredients. Add to the pot when the oil shimmers in a single layer. Cook for 3 to 4 minutes, or until the first side is pink. Flip each shrimp and continue cooking until opaque (another 2 to 3 minutes). Remove to a plate and set aside. Add the remaining oil to the pot (heat still on medium). Add the onions and cook until soft and golden, scraping up any fond left behind by the shrimp. Add the garlic and ginger. Cook until fragrant (just a minute or two). Sprinkle in the curry powder, garam masala, smoked paprika, salt and flour, stirring to coat the vegetables until a paste begins to form. Add one cup of vegetable broth and stir until the mixture has smoothed out. Add the remaining cup of broth and the tomatoes. Turn heat to high, bring to a boil, then return heat to medium how. Allow the soup to simmer for 15 minutes. Turn heat to low and add the coconut milk and reserved shrimp. Taste, and adjust for salt and pepper. Stir in the cilantro and ladle into serving bowls. This entry was posted in Indian, Seafood, Soup on January 17, 2014 by Miranda @ Tempest Books. Heat the olive oil in a large pot over medium-high heat. Add onion and cook, stirring occasionally until translucent. Add garlic and spicy sauce and cook 1-2 minutes more. This entry was posted in Asian, Chicken, Soup on January 17, 2014 by Miranda @ Tempest Books. Brown the ground turkey over medium-high heat in canola oil in a sauté pan, but don’t cook all the way through (about 4 minutes). Season the turkey with a little bit of salt, pepper, and chili powder while it’s cooking and break up meat with a spatula. Meanwhile, add the rest of the ingredients (spices to taste) to the slow cooker. When the turkey is done, add it to the slow cooker, stirring to combine. Cook on HIGH for two and a half hours. Serve with a bit of parmesan cheese on top. 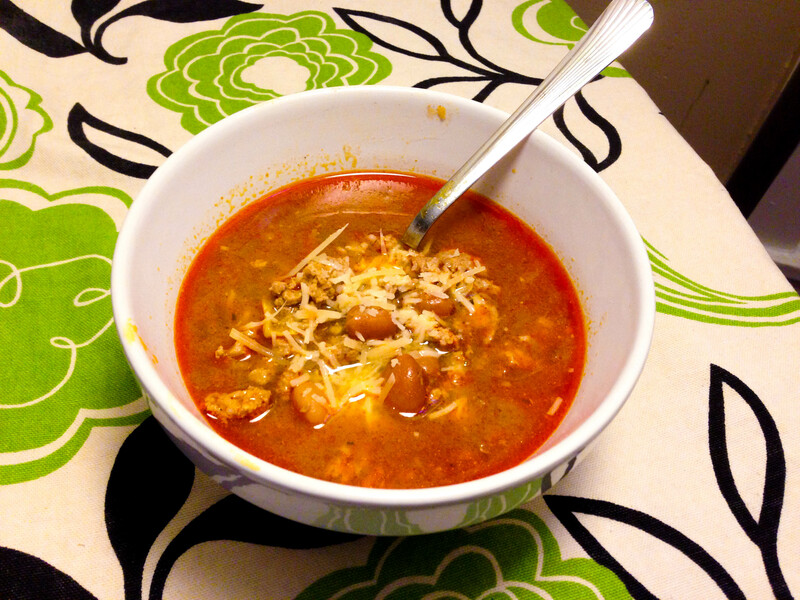 This entry was posted in Chicken, Mexican, Slow Cooker, Soup on January 17, 2014 by Miranda @ Tempest Books. In a large stock pot, heat the olive oil and add your garlic, onion, and celery, stirring frequently over medium high heat. Once the onion is translucent (5 minutes). Add your vegetable broth, water, and tomatoes. Add your spices and stir. After a few minutes, add your spinach and allow it to wilt. 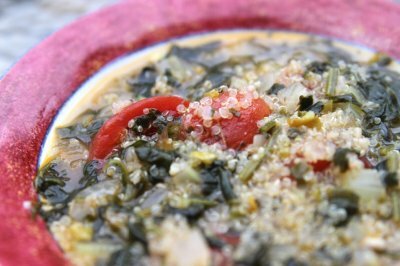 Lastly, add your quinoa, lower your heat and simmer for at least 30 minutes before serving… Enjoy!